The purpose of barrier coatings in food packaging is the ability to block water, water vapor and other liquids from passing through materials that typically are highly porous. 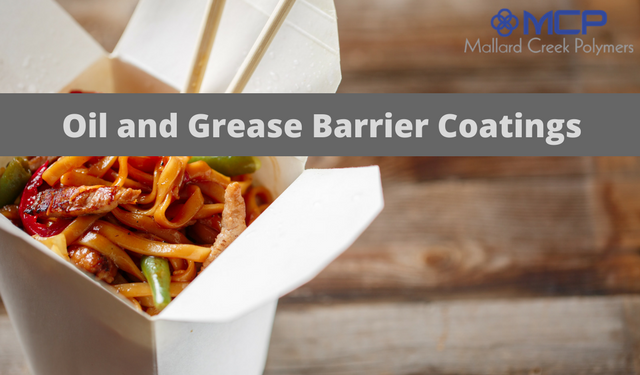 Not only can these barrier coatings make items like paper and cloth water-resistance, they have the added benefit of blocking grease and oil. At first, that might not sound like a big deal, until you begin to imagine what life might be like without these high-tech barriers, which are actually emulsion polymers. Stopping by the coffee shop for a morning French Roast, ordering a burger and fries for lunch in a drive-thru, and picking up pizza for dinner are ordinary events that take place millions of times each day across the globe. Each and every time these events happen, consumers intuitively and unknowingly rely on barrier coatings formulated with water-based emulsion polymers to perform without fail. Paper and paper board manufacturers are also depending on a zero fail rate. That’s because no one wants coffee or any other beverage seeping through a paper cup to stain their clothes and ruin their day. The fast-food lunch and pepperoni pizza, like most food items, contain various amounts of oil and grease, none of which should ever make it onto a car’s upholstery or your favorite jeans. Salads and salad dressings, home-style vegetables, apple pies and chocolate bars present the same types of messy challenges for consumers and food processors. In order to make food fast and convenient, barrier coatings formulated with styrene-butadiene or styrene-acrylic emulsion polymers are applied to paper and paperboard substrates as thin, lightweight, and translucent coatings. These coatings are often overlooked by the consumer. To fully appreciate the vital role barrier coatings play in our daily lives, let’s take a quick look at the basics of food packaging and what makes it effective. Today’s packaging solutions allow food products to be delivered conveniently, served on-the-go, stored longer, shipped further, and handled by numerous workers across a wide variety of environments while still maintaining its texture, flavor, appeal, nutritional value, and edibility. Packaging must be able to safely store and transport food while preventing contamination. Barrier coatings formulated with polymer emulsions such as styrene-butadiene and styrene-acrylic help solve these challenges and keep food and beverages fresh, looking great, and safe to consume. Bags, buckets, and wrappers for ready-to-eat food products from a restaurant or convenience store aren’t designed as much for thermal insulation and protection as they are to be moisture and grease barriers. Anyone who has snarfed down a large order of fries while driving to their next appointment can easily appreciate the fact that all that the oil and grease from the fries does not penetrate through the box onto jeans or the car’s upholstery. For stored and distributed foods, packaging must keep all of the original food contents inside the package and keep all external contaminants outside the package. It must do this consistently from the processing plant to the kitchen pantry. That’s what keeps food safe to eat, tasting like it’s supposed to taste, and smelling like it’s supposed to smell. It’s also important for public safety, which is why in many cases food packaging must meet requirements set by the Food and Drug Administration. Inside food packaging are usually some amounts (a little or a lot) of gas, water, oil and grease. Aside from acting as barriers to prevent messy situations, interior barrier coatings do something else that is equally as important. Loss of gas, water, oil or grease can not only change the intended flavor of foods but also make them inedible. Ensuring that these ingredients stay inside the food container for long periods of time is critical for keeping food tasting great and maintaining its nutritional value. On the other hand, water, liquids, and gas are also trying to get into food packaging when it certainly shouldn’t. For example, light can affect food safety and taste, as well as water vapor and oxygen. Oxidation, a chemical reaction that occurs when elements are exposed to oxygen, is a major cause of food deterioration and bad taste. To prevent these types of food contamination, exterior polymer coatings on paper or other packaging material must also excel as water, water vapor, oil, and gas barriers. And that’s just the beginning. Along with our previous posts about emulsion polymers in bath and steam rooms and in the auto industry, we’ll also see more benefits in future posts. Stay tuned to see how aqueous polymers provide important solutions not just in the food industry but in many industries that touch our lives on a daily basis.